Where are the setting files placed? You can find the setting files position at the About FreeCommander dialog (main menu “Help → About…”). Can I use the setting files from older XE (32 bit) version in the new XE (32 or 64 bit) version? Yes, the setting files from all XE versions are compatible. 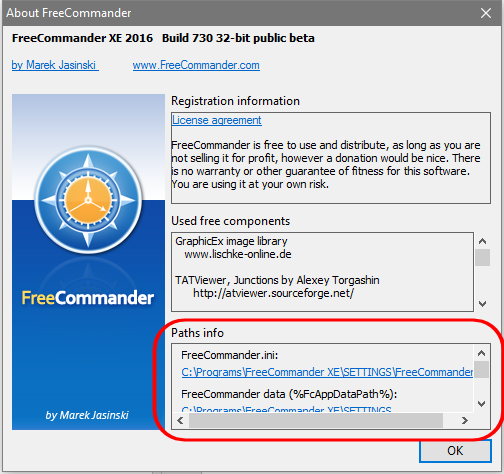 However, the settings of old FreeCommander version 2009.02b or earlier are incompatible with the new XE versions, and cannot be transfered. Can I copy the setting files to another computer? Yes, just copy the Settings folder, while FreeCommander is not running. 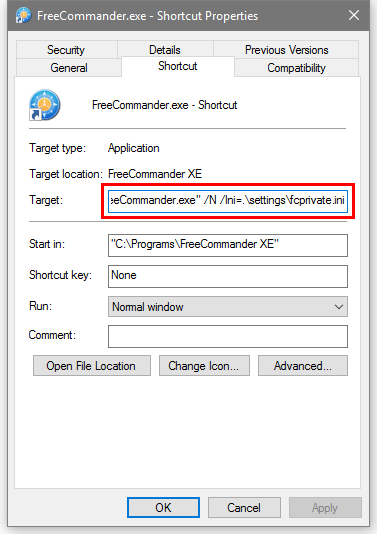 If the Settings folder in in the FreeCommnder installation folder, you can copy the whole FreeCommander folder (while the program is not running). How to backup all settings? Under the menu item “Tools → Backup all settings…” all FreeCommander settings can be saved additionally (to “Save settings”) to another folder. After activation of “Backup all settings…” a folder has to be chosen first, where the backup is to be stored. In the dialog “Browse for folder” the folder is selected, that is defined in the option “Backup folder for settings” of the menu item “Tools → Settings → General”. How to restore all settings? Under the menu item “Tools → Restore all settings…” all stored or backed up FreeCommander settings can be restored. After activation of “Restore all settings…” a folder has to be chosen first, that contains a backup. 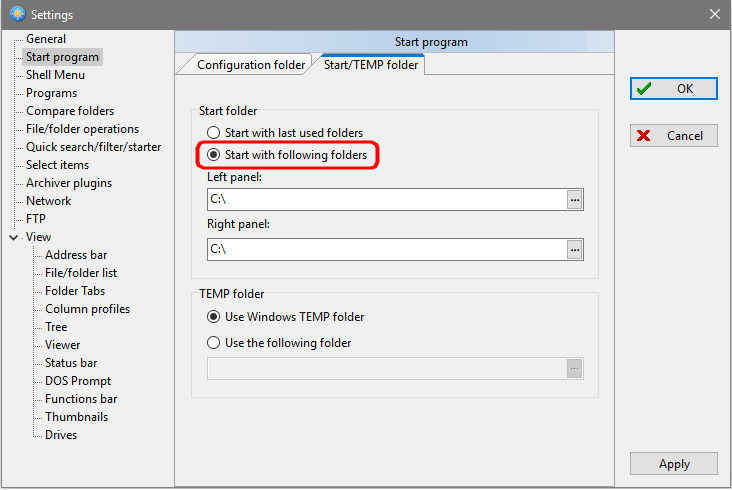 In the dialog “Browse for folder” the folder is selected, that is defined in the option “Backup folder for settings” of the menu item “Tools → Settings → General”. How to prevent accidental closing of the FreeCommander, when closing other windows with Alt+F4 shortcut? Open the “Settings (F12) → General” and check the option “Show confirmation dialog on exit”, then click the OK button. May I minimize the FreeCommander to system tray? Yes, open the “Settings (F12) → General” and select the option ”Minimize to system tray“. Note: You can use also the sub-options “Handle closing as minimization” and “Always show system tray icon” if you wish. Is there a private session in FreeCommander, as in web browsers? 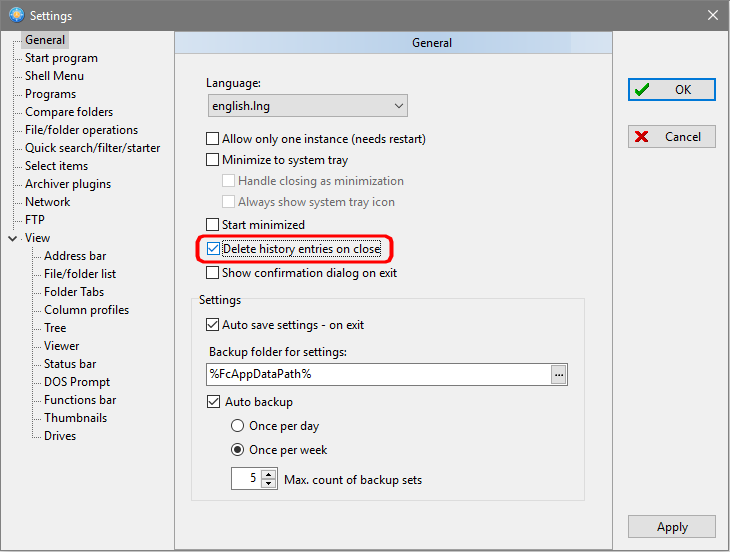 Open the “Settings (F12) → General” and check the option “Delete history entries on close”. If you want to to use these settings only in some occasion, you can use the command line option /Ini= and set the settings above, so they will be used only when using this command line option. You can also create another (desktop) shortcut for this private session with different settings.